Decorating eggs has been an Easter tradition in our family for as long as I can remember. The classic dip-dyed method is one of the easiest ways to decorate eggs. It’s timeless and will always be the best in my book. When I was younger we used rubber bands to make patterns, but I always had trouble with getting them to stay on, so this time I’ve gone with the simple and effective crayon drawing which has a guaranteed effect. You can blow the eggs if you’d like them to last a long time, or simply use hard boiled eggs. 1. Draw on each egg with the white crayon. At this stage you’ll hardly be able to see the crayon, but don’t worry, it won’t stay this way. 3. Place your eggs in the bowls and roll them through the dye until the eggs are the desired colour. You can use a spoon or wear rubber gloves if you don’t want to colour your fingers. You’ll notice that the dye does not colour the wax from the crayon. 4. Place your eggs on paper towel to dry. 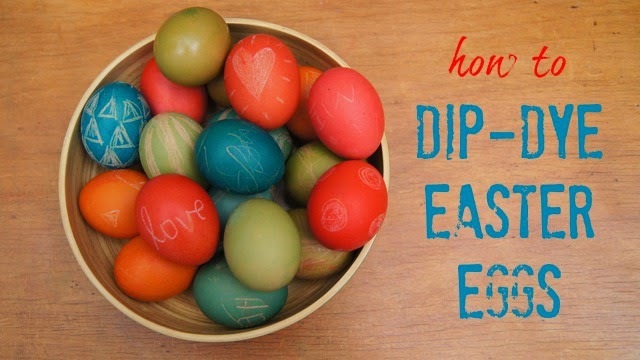 These dip dyed eggs in a bowl make a lovely Easter decoration, or if you use boiled eggs you can serve them up to your kids for lunch or even have an Easter egg and spoon race! For some different egg decorating techniques you might like to try dying with silk, decoupage with napkins, covering in origami paper, naturally dyed eggs, leaf print eggs, drawing with sharpies or rolling in glitter. Is egg decorating a tradition in your house? This post is part of an Easter series here on Frog Goose and Bear. 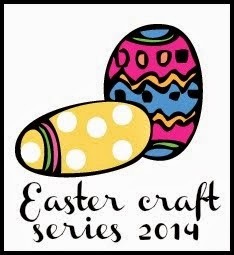 To see all of the Easter crafts, recipes and activities in this series, you can click on the image below. This post was originally published on Kidspot.com.au in March 2013.